Let me introduce you to the most important man in the village; Sr. Alberto Martins. There he is in the photo and I challenge you not to take an instant liking to him. Now there are many who will feel seriously miffed by my writing this. Many may believe themselves superior to Sr. Alberto. Indeed, on the social scale they certainly do stand far higher than he does – one or two very high indeed - but the question is this: how do you measure importance? By titles, qualifications or usefulness? To find out more about Sr. Alberto and why I rate him so highly, click here. In my home town of York, everyone knows a shop called Barnitt's. 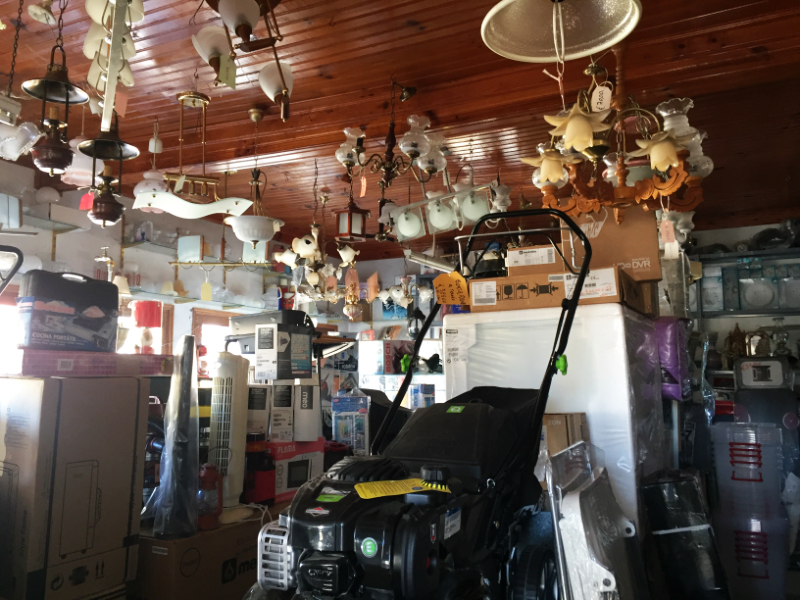 If you mention to your neighbour that your electric kettle has conked out; or that you need a new rake for the garden; that you really could do with a cordless drill or even that you are thinking of investing in new Christmas tree lights, they will without fail say, "Oh, you must go to Barnitts." Everyone adores Barnitt's and if you can't find what you want there then you probably won't find it in York at all. In our village, Sr. Alberto is a one man Barnitt's and much more besides. This is the front of his emporium. On the awning, to the right you will see that it says, "Comércio Tradicional" – traditional business - and that's just what it is. When we arrive late from a trip away, we won't go hungry. 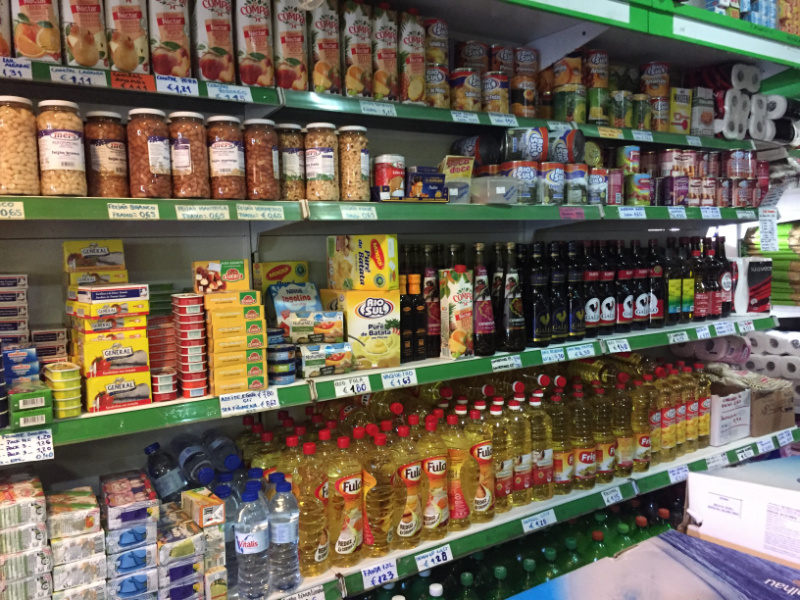 All we need to do is pop into Sr. Alberto's shop and buy eggs, cheese, milk, bread, maybe some olive oil and frozen prawns, and so on. And while we're there, we might just pick up a handy ball of twine and some seeds for the garden to keep us busy on the following day. Unfortunately, we don't have the internet at home – at least not yet – so first thing in the morning we'll make a trip down to Sr. Alberto's because, as you may have noticed to the left on the awning of the shop, it also says, "Café Snack-Bar". Just behind the shop some local labourers are having their morning aguardente in the bar. (Heaven help their stomachs but it's traditional in large parts of rural Portugal.) We, however, will have a breakfast galão, a sort of café latte, probably served by Manuela, Sr. Alberto's daughter-in-law, and take advantage of the internet connection. While we are doing this, as likely as not, Sr Alberto will come in to see how things are getting on in the café. As soon as he sees us, he will come across, a big beaming smile on his face, to ask how we are and to tell us how pleased he is to see us. Sr. Alberto is apple-cheeked and jovial, exuding warmth and goodwill to all the world. He is quite well into his eighties, but you would never guess it as he drives off to the Cash and Carry to get in more stock. And what an Aladdin's Cave of stock he has! 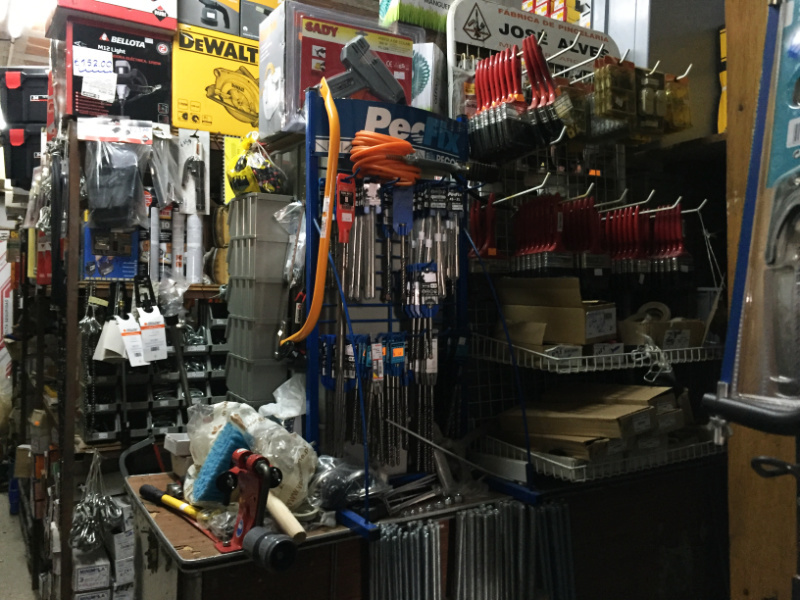 Next door to the shop and café/bar is a warehouse where you can buy every possible sort of tool you might want: hacksaws, paint brushes, spanners, strimmers, a wheelbarrow and I've never before seen such a collection of nails and screws. Whatever diameter or length you desire, Sr. Alberto will have it. Maybe you're not doing D I Y, though. Perhaps it's autumn and you've picked the grapes but disaster has struck: last year's barrel seems to have sprung a leak! Fear not, in some nook or cranny Sr. Albert will have a replacement. Perhaps, though, it's something for the house that you need. A cooker? A washing machine? A TV? A chandelier? 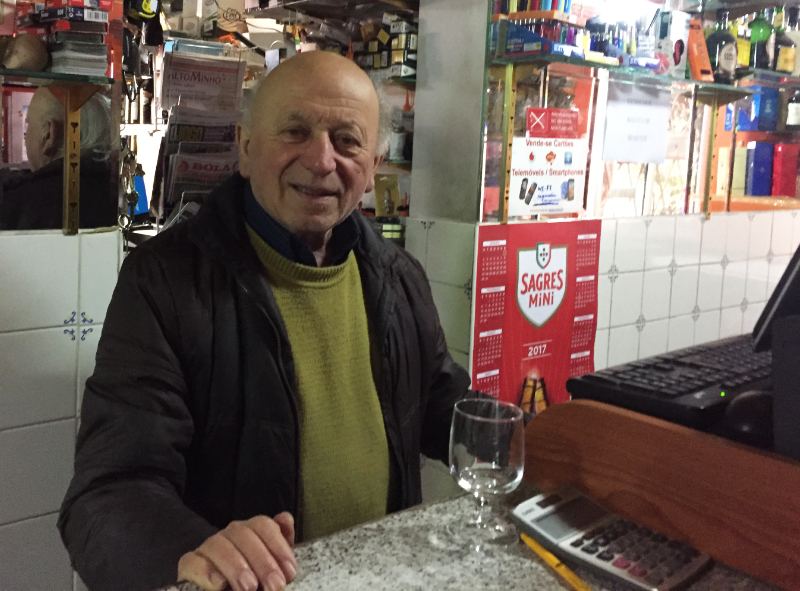 Then just pop down to the Comércio Martins and get one from Sr. Alberto. And then again it might just be someone's birthday and you've forgotten to get a present. No problem. How about the porcelain figurine of an old man playing a guitar? Or maybe a bike or a game of Subbuteo for one of the children? I once remarked to Manuela that stock taking must be impossible there. "Oh no!" she said. "When we make the tax return, we have to do a stock taking so the whole family comes in and helps. We can get it done in a day." That must be because of Sr. Alberto's gargantuan memory. He knows just what he has and where it is. 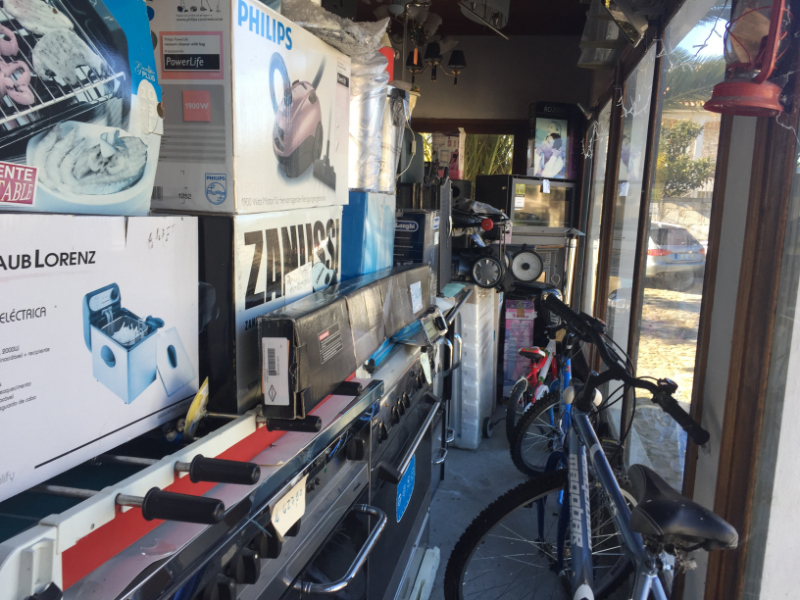 Nuno, his son and Manuela's husband, would like to get his hands on the warehouse and put in modern organisation but his father isn't ready to hand over the reins. Sr. Alberto looks so fit and spry that he seems likely to live as long as Methuselah, so Manuela reckons she knows what will happen when Nuno's turn does come. "He'll be so old that he'll have lost interest in the latest technology and everything will carry on just as it always has," she says. In a little room inside the bar there is a pool table and miniature football, which the students from the Agricultural College in Refoios, a village half a dozen kilometres away, come to play during their lunch time while the local youths sit outside under an awning, nursing one beer all afternoon and maybe all evening too. "I don't think he makes any money out of the bar," says a friend. "I think it's a social enterprise. He provides somewhere for young people with no money to meet and talk." Perhaps he does and isn't it better than them being out on the street causing trouble? Sr. Alberto is kindly, hard working and entrepreneurial. Where does he stand in your estimation? He stands pretty high in mine. In fact, whatever the local "great and good" may think, I think he really is the most important man in the village. Wonderful! I know Barnitt's and it doesn't sound a patch on this shop... and Barnitt's employs dozens if not hundreds of staff. I wish this shop and Sr. Alberto were in my market town east of York! I think there probably were British equivalents to Sr Alberto once upon a time and then came the super markets, the DIY stores and the cafe chains. They serve their purpose in a busy world but they don't have the charm and charisma of the old-fashioned independent shops. 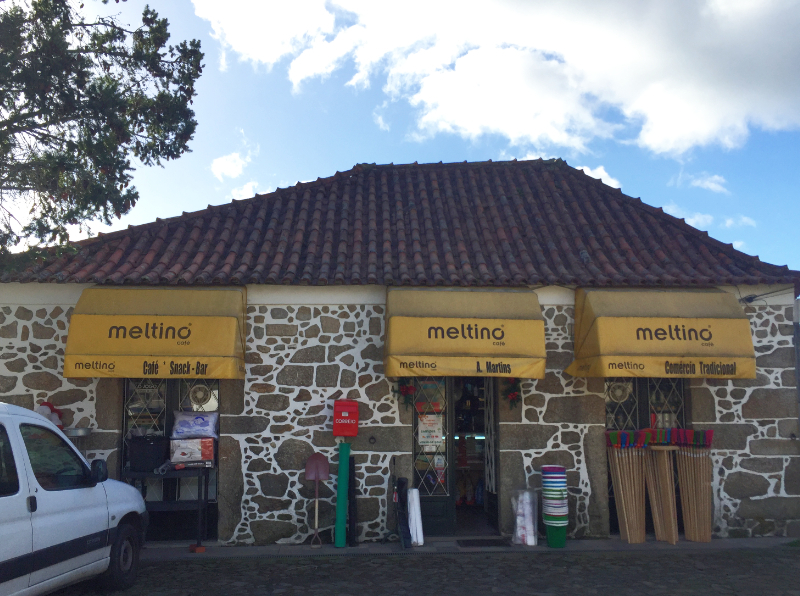 Not many villages in Portugal have a shop like the Comercio Martins either. It wasn't part of our thinking when we bought here but I now realise how lucky we are to have chosen - unknowingly - so well.